It’s October so that means it’s officially Fall marathon season! This month there are TONS of marathons – Chicago, Marine Corps, Mowhawk, Hartford, Twin Cities, Baltimore, Steamtown and Detroit, just to name a few. 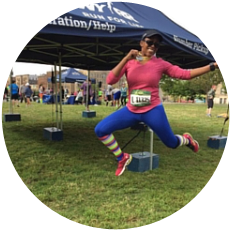 Although I didn’t run a Fall marathon this year, I’ve been so inspired by all of the runners on social media. They have been putting in hundreds of miles of training all throughout the hot and humid summer and now it’s time for their victory lap. If you’re like me, you love to listen to music during a run or race. Honestly sometimes music is the only thing that keeps me motivated, especially during a long run or race when I’m running for hours. For me, music helps to keep the negative thoughts and self doubt at bay. Also I can get lost in a song and not focus on my pace or any pain I may be feeling. I did a playlist for each of my three marathons and here are some tips you can use to build your marathon playlist. I call this the “victory lap”. This is where you can play any song that puts a smile on your face. My personal favorite is “Happy” by Pharrell Williams. I will play that on repeat until I cross the finish line. Another good song for this would be “Smile” by Lil Duval. I will probably use that song for my last mile if I do another marathon. Finally, and most importantly, make sure your phone/iPod and headphones are fully charged for race day! You wouldn’t believe how many times I’ve heard from runners that their iPod died half way through the race or that their headphones wouldn’t turn on! Do you run with music? IF so, how do you build your race playlist? I agree with you, the final miles of the marathon call for some dig deep kind of music! There are certain songs that have propelled me to a great finish and those songs have a special place in my heart. Whenever they come on during a run, it takes me back to that moment when I persevered. Music is an amazing motivator! Music is everything to me when I’m running. I’m convinced that it has saved me from a few DNFs! Great advice! I love that your marathon playlists are so methodical. Honestly, I just want to hear music that I like and that keeps me hype! I do admit that I’ve had Lose Yourself come on early during a race and it kind of threw me off…I didn’t need to dig deep just yet, haha! LOL right?! Yeah I have to reserve Lose Yourself for the second half of any race. Definitely overdue to update my training playlist! I do have a few of these already on mine (#musictwins) but a few that I don’t and need ASAP!! Those are two really good songs for the end of a half marathon! You have this so well thought out and I love your song picks! Silly me just lets my songs shuffle so I get whatever whenever. In Berlin my Bluetooth headphones wouldn’t pair so I was sans music. At NYCM I put together an hour’s worth of tunes and let them repeat. Glad you found some new songs to add to your playlist. You’re going to do fine in Philly – I just know it! I don’t run with music, but in my last marathon in 2014, they were playing Happy on a huge speaker during mile 20 of Rock ‘n’ Roll San Diego, when I was running up a 2 mile or so uphill stretch on the freeway, which was so hot and boring. As soon as the song started I felt like dancing (actually did a little 🙂 ). I’m glad that song gave you some happiness as you were tackling that hill! I love your song choices! I especially love Happy for the Victory Lap! Thanks for the great playlist! You have a good variety of types of music here. Thanks Laurie! Glad you saw some songs that you liked on my playlist. Looks like we have similar taste! Music is an absolute must for me -, especially for those final miles. Can you imagine having your music die out during a marathon – yikes! That’s one of my worse fears! Eminem always gets me over the hump during a race! As my runs start to get longer, I really need to up my playlist game! Thanks for the great suggestions! No problem! Glad you found some songs to add to your playlist. LOL this is true. Sometimes by mile 25 I am so focused on trying to finish that I don’t really know what song is on, haha.